The 29.8 metre motor yacht Favorita, listed for sale by Bjorn Vang-Mathisen at Ocean Independence, has been sold. 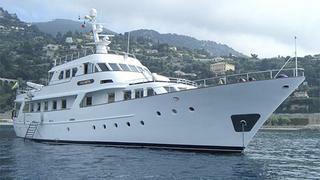 Favorita was built in steel and aluminium by Italian yard Benetti and delivered in 1975. In 2009/2010, she was sympathetically restored with all technical areas renewed or overhauled and great care was taken to preserve the original interior and decks of this classic Navetta superyacht. The saloon is bright and airy featuring high gloss wood paneling, dark blue carpeting and crisp white soft furnishings, all highlighted with natural light provided by the large panoramic windows. A full wet bar is forward of the lounge area complete with fitted bar stools. Further forward is a formal dining area while her spacious aft deck is fully equipped for al fresco entertaining and dining. Favorita sleeps six guests in three double cabins, all with en-suite facilities and all with flat screen televisions plus DVD systems. An optional twin cabin with bunk beds can be made available if required, but this cabin is better suited for children. Twin 650hp Detroit Diesel engines give her a cruising speed of 10 knots. Favorita was asking €1.25 million.